I got called heartless for not spending Christmas with my family. And before you judge me, I thought the same just a few years back. How can one not want to spend Christmas at home? To me it’s not that I don’t want to spend quality time with my family, but there is this urge in me to go and discover. And since this year has had many ups and many downs I decided to end the year how I started it: in Mexico. Spending Christmas abroad (again) doesn’t mean I don’t love my family. I do so deeply and they love me too. That’s the reason why they said it was okay for them to let me spend yet another Christmas away from home. Now don’t you call them heartless! They are the most precious people to me and I don’t know where I’d be without them. My mum even put up the christmas tree a week earlier than usual, and decorated it nicely. Just the day before I left for my beloved Mexico we pretended it was Dec 24th already. We had a lovely dinner, sat together and were grateful for each others company. Since it was Christmas for me, there were also some gifts under the tree. Books, travel diaries, more books and a fleece jacket with stunning embroideries that my mum made herself. 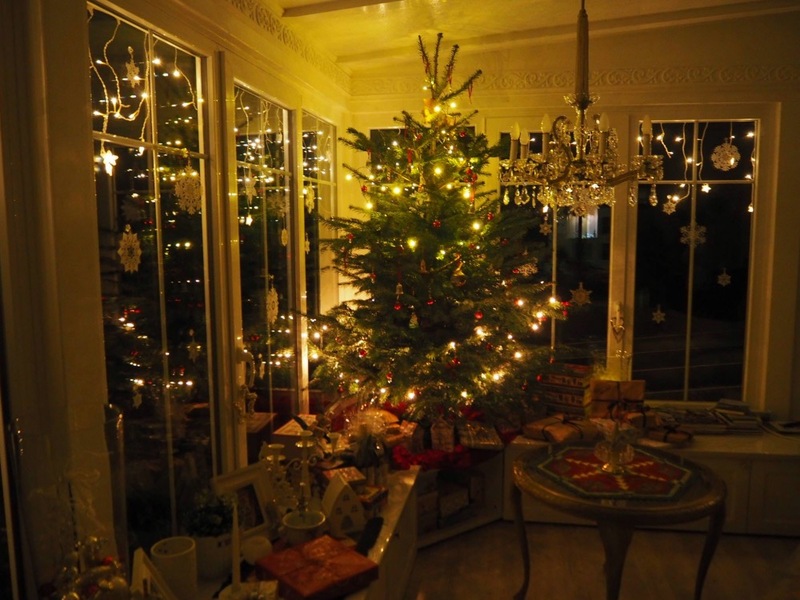 So to me Christmas has already happened: a calm evening with my family. Everything else that’ll happen in Mexico will simply be a great addition to that Christmas I already had. I started the first days of my trip in Mexico City. When I first visited in 2011 I fell head over heals for this city. I can’t quite say what it was that made me feel this way. I felt home. I felt welcome. It felt right. And this time it was the exact feeling that came up in me. This time I allowed myself the luxury of a cab to take me to my hostel, which conveniently is located on the Zocalo – the main square. 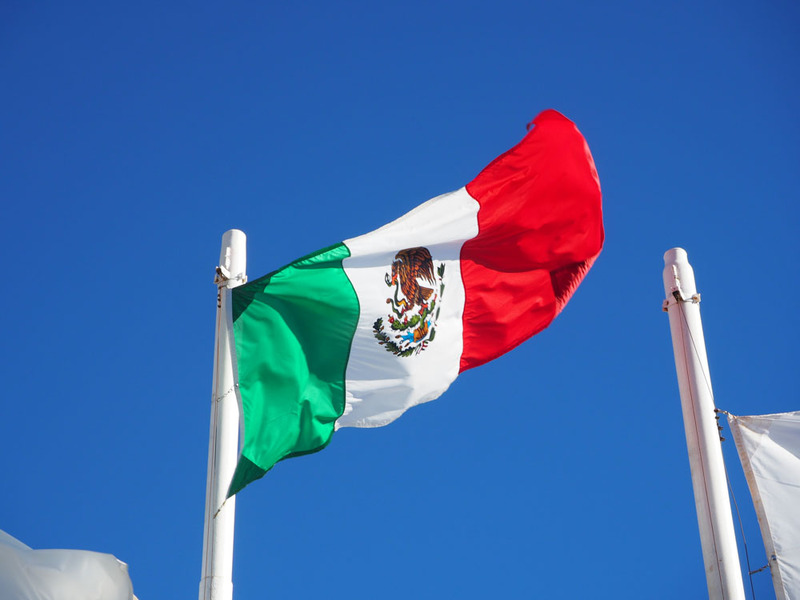 When we turned onto the street that goes straight to the Zocalo, I could also see the huge Mexican flag and many, many lights. 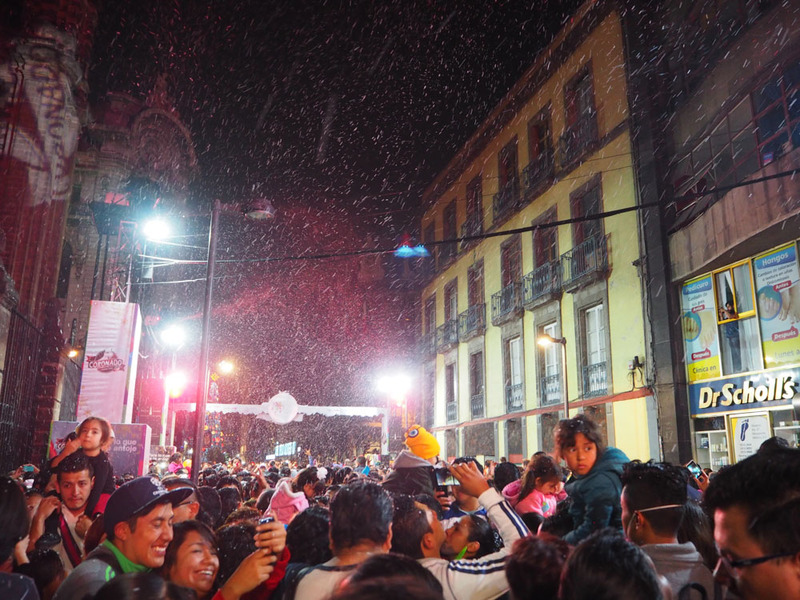 We had to go around the Zocalo to get to my hostel and I was speechless as I saw even more lights and so many people out in the streets having a great time. Okay, okay, yes it’s just „artificial“ snow, BUT I didn’t even expect any kind of snow. Although the streets were packed with people it was like someone activated the „Christmas mood“ in me. I couldn’t stop smiling and I would have loved to dance in the snow if it wasn’t for the many people being completely fascinated by the snow as well. International and Mexican Christmas songs were played over the speakers and it was just so special to be there. 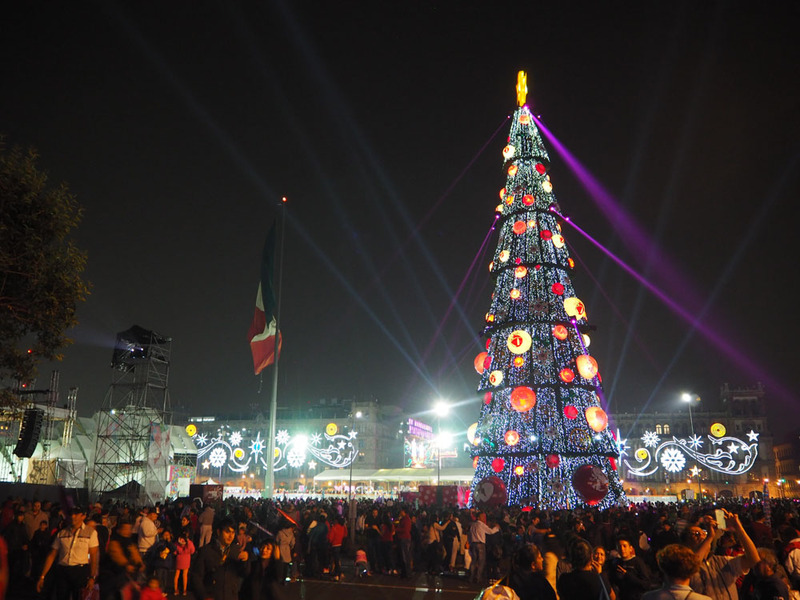 The surrounding buildings of the Zocalo were illuminated gorgeously as well as the huge Christmas tree. They even illuminated the catedral – the cathedral had gotten many colorful spotlights. 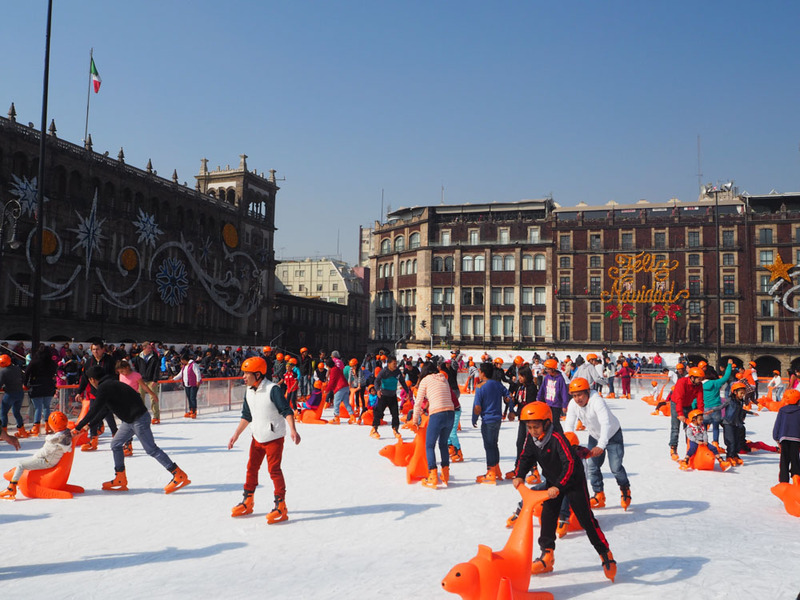 A few years ago my dad came home from a business trip from Mexico and told me about this huge ice skating rink on the Zocalo in Mexico City. No way I was going to miss it this time! 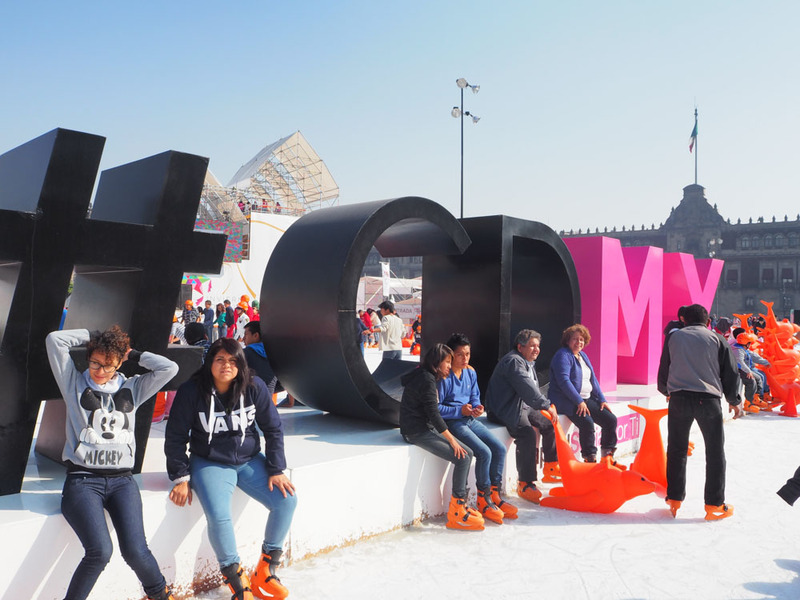 They open the rink at 10am, you’ll need to register and get a free ticket at the white and pink container next to the cathedral. 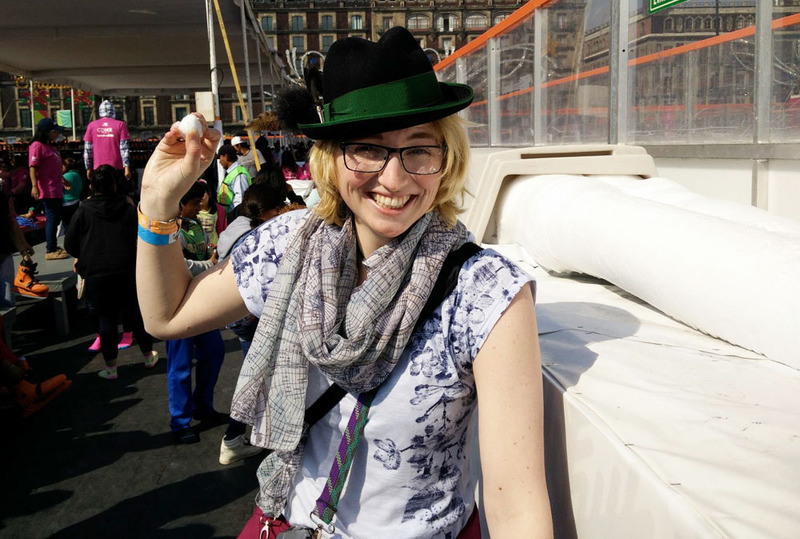 You’ll be allowed to ice skate for an hour, so make sure to get your ticket before that. I got mine around 20 minutes before the next full hour started. Then make your way to the (huge) line and get in. Note: you are not allowed to take any backpacks or handbags or any other bags with you. You are (officially) only allowed to take pictures right in the middle of the skating rink in a marked area. With your ticket you’ll get a pair of skates (and a helmet if you wish) and wooooosh you are ready to go ice skating! Yeah!!! In the background the huge cathedral, the massive Mexican flag, the stunning Christmas tree made this day a once in a lifetime experience! We had so much fun going round and round and round again! We shared childish laughter and chased each other on the rink. I can’t find the right words to describe it, but when we found a bit of snow we started a tiny snowball fight! How could we not?! After a short ride from Mexico City you’ll get to Puebla. I’ve heard so many great things about it that it was clear to me that I had to grant it a visit too. I arrived rather late on an afternoon, dropped my things in the hostel and went for a quick walk around the city centre. I had intended to walk around for much longer, but I got stuck only a block from my hostel. The reason for that was the Zocalo. 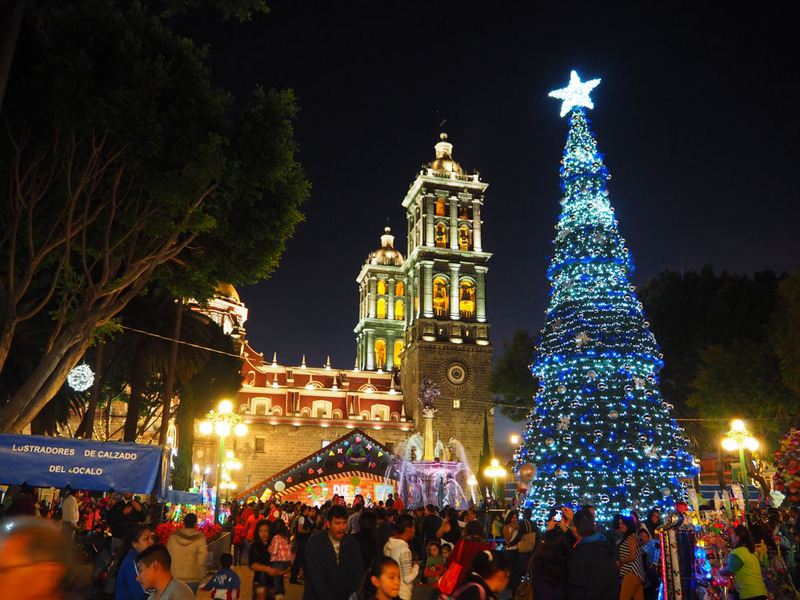 The most main squares (Zocalos) are pretty during any time of the year, but now during the Christmas season they are highly and fancily decorated. There was also an ice skating rink here and a big slope for the kids. Even a Christmas market was there. The cabanas or small huts were painted to look like gingerbread houses. 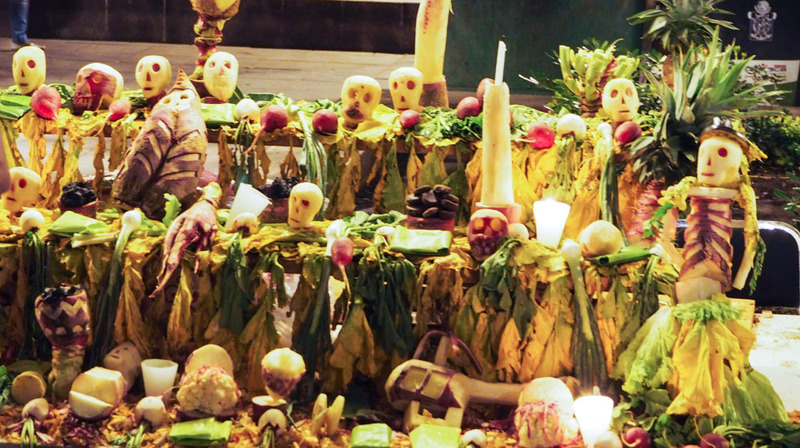 The night of the Radishes is celebrated on December 23rd. When the Spanish brought radish to Mexico back in the colonial times farmers started to carve some of the oversized veggies. They have a long tradition of traditional wood carving and kind of took it to the next level with other organic material. 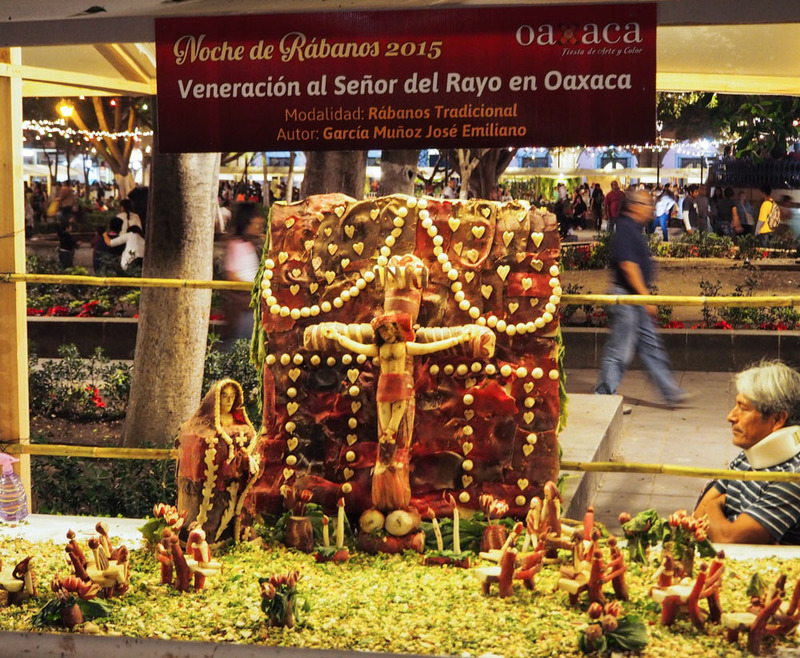 For over 100 years these carvings have been displayed in downtown Oaxaca and a winner is chosen in the contest. More than 100 contestants show off their art work and thousands come to see. During the day I couldn’t tell if it was Christmas Eve or any other day of the year. In Austria you won’t find many people out after noon. Most of us would be at home preparing a feast for the family and getting ready for the Christkind singing songs and maybe even reading poems. But, yes we know, that Mexicans do it differently. And they do it with a lot less seriousness. Not to say that they do it carelessly, but I’d say more with the heart. When the sun set fireworks started to fill the dark sky. This was the point when I started to feel christmassy this year though there are no fireworks in Austria on Christmas Eve. The streets began to fill and fill with people. Traditional songs were played loudly in the streets either off a CD or performed by musicians. I had already spotted big balloon-like decorations throughout the city during the past days. Now I found out that most of them were piñatas. Those that are stuffed with sweets and get hit with a stick at children’s birthdays. They are very common for Christmas too! I’ve always wanted to hit a piñata and get crazy about the candies. At the lovely hostel they’d arranged a small piñata for us travellers. 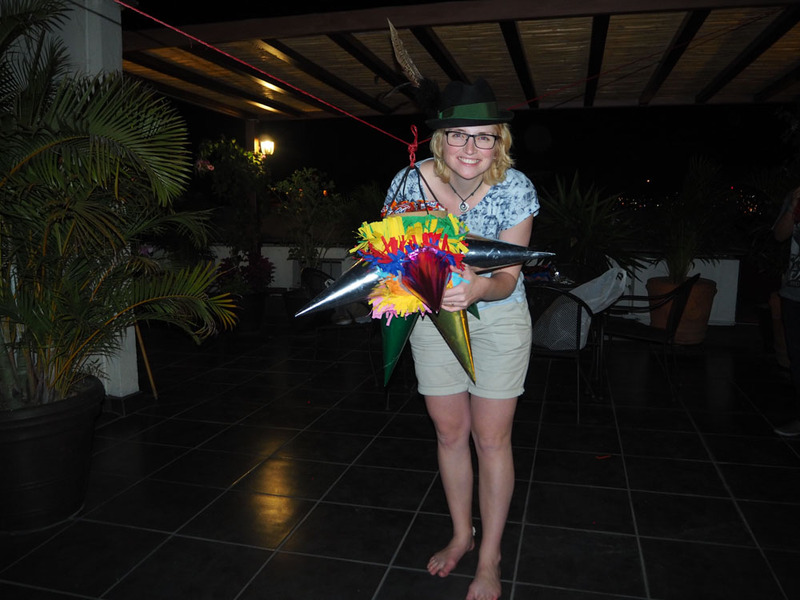 On the rooftop terrace the piñata was set up and I was the first to go. I got blindfolded, spun around, a special song was sung and then I got told to start hitting the piñata. I did hit it, but somehow I broke the stick! Two other girls tried their luck until the piñata busted on the floor. We shared the candy and decided to go for a walk to the Zocalo. 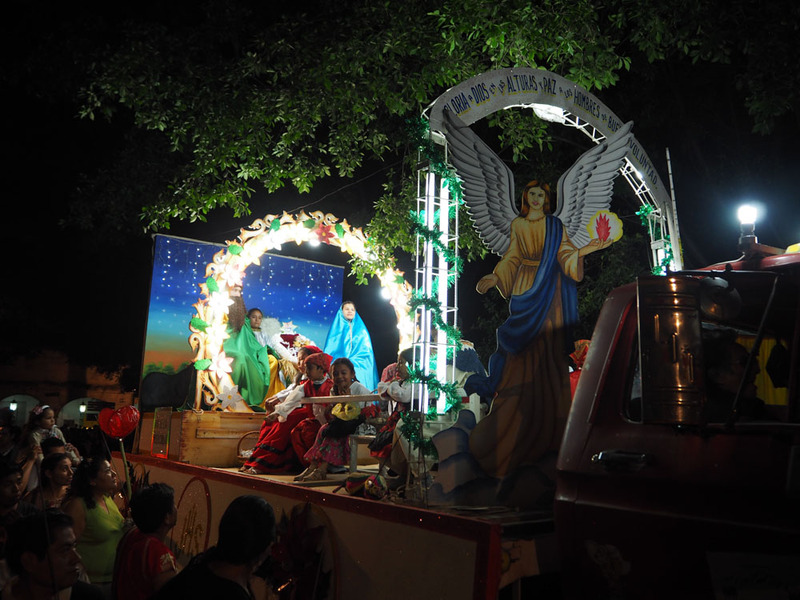 Parades wandered through the streets with children dressed as Mary, Joseph, the Angels and others that are known from the nativity scenes. Again lots of songs were performed by bands and people were eager to watch. 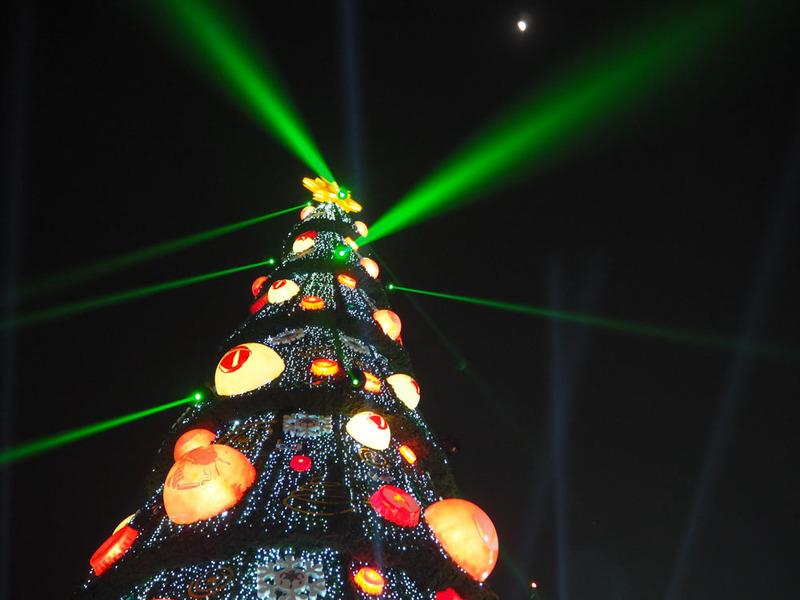 Have you celebrated Christmas abroad? Maybe even in Mexico? Share your thoughts in the comments with us!